The crucial question before us when we arrive at the “Pearly Gates” is not, “Who is your lawyer?” or “Who is your accountant.” The crucial question — then and now — is “Who is your Savior and what have you done with your faith?” And it’s the same question that is before some of the disciples of John the Baptist in today’s Gospel Lesson. John the Baptist is in prison. He is well aware that execution at the hands of King Herod awaits him. So he sends some of disciples to Jesus. 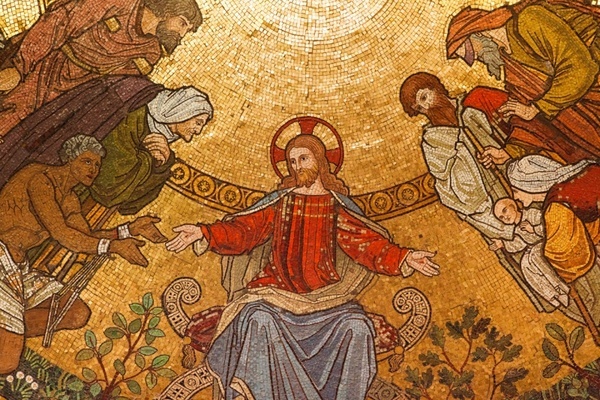 And they seek Jesus out and, to make certain of His identity, ask, “Are You the one who is to come, or do we have to wait for someone else?” (Mt. 11:3). In other words, “Are You the Messiah?” “Are You our Savior?” Jesus does not answer “Yes” or “No.” Rather He invites them to open their eyes, ears and hearts to what is going on. “Go back and tell John what you hear and see,” He says. “The blind see again and the lame walk, lepers are cleansed and the deaf hear, and the dead are raised to life and the Good News is proclaimed to the poor” (Mt. 11:4-5). That answer is hardly a description of the Messiah they had been expecting, but it is a perfect description of the kind of Savior Jesus revealed Himself to be: the “Man for Others.” And then Jesus says, “Happy is the man who does not lose faith in Me” (Mt. 11:6). We’re all on a faith journey. That’s why we worship together, most of us. And most of us have experienced the twists and turns and detours we encounter along the way. But what is faith to you? Is it belonging to a denomination? Is it something that you were brought up with and just feels natural to wear – like your favorite sweater? Is it a declaration that you accept certain beliefs and they are part of your core belief system? Or is it the abandonment of yourself to Jesus Christ? You see, faith can be any of those and faith is composed of a part of all those. But the attainment of truly believing in Jesus Christ is when we abandon ourselves to Christ. Abandonment to Christ is a great word. Think of it from an epistemological perspective. Abandonment invokes a sense of being alone. Abandonment involves a sense of detachment – you are letting go. Abandonment of self carries an even more powerful connotation – that you are letting go of the things and events in your life that make up who you are. Now the meat is on the table. Our faith is supposed to be not only a complete belief in the way of life that Jesus called us to but a commitment to coupling those words with actions so that we LIVE our faith. Now there are some who cannot accept a complete belief in Jesus Christ. And, there are those that can say the words and there are those that can play the part. But the complete faith that Jesus calls us to dictates the things we say, the things we do and our relationships with one another. Remember last week’s Gospel? Remember I mentioned that John the Baptist did not stand in the Jordan inviting everyone to come forward to be baptized. No, instead he would only baptize if the person was willing to correct their lives and live them in total accord with Jesus Christ. Total accord. How many of us can say that? I would guess that there is only a handful here today who can reach for that standard of conduct and say they can attain it. But that is what we are called to. So those who can’t attain it are left to do what? Well maybe if go to Church, live a relatively good life, I can trust that will be enough. Is that enough?? Let me ask you something. Do you think our world today would be any different if we truly lived our faith? Of course it would be. We know that darkness comes because we have too many who say the words but do not live a life that is in accordance with THE word. That is why the second definition of faith is so meaningful. Abandoning ourselves to God means that we so totally believe in Him and we are so confident in that belief that we are willing to take a step aside and leave ourselves totally in His hands. Now that does not mean standing there like a lump of clay and waiting for Him to direct our lives or take action. What it does mean is that when the events of life surround you with their consequent decisions ; then those decisions, those actions, those “major moments” are done only after time spent in prayer with Him, asking for His guidance in discerning the actions that you should take. So there is the formula for having faith. A willingness to so live our lives that they are in total union with Him and his teachings. That means always believing that by yielding a part of our lives to Him that He will lead us, He will comfort us, He will provide for us, He will always be at our side, He will never forget us. We are called to march with Him to a drumbeat that may not be in accord with the rest of humanity, not in accord with the times and not in accord with the politics of the day. Now that I face the last years of my life, and have been witnessing to Him for 41 years, I have come to the realization that trying every now and then to be a follower of Christ is not living our faith. Rather every breathing minute of our lives should be spent recognizing that He is at our side and watching to see whether the words from our mouth, the thoughts from our minds and the actions from our hands are those that mirror His love. As Christians, the Gospel Message that promises we will be welcomed into the Coming Kingdom of love, keeps us hoping. As Christians, the Gospel Message that promises our Gracious God will take care of all that we have entrusted to Him, keeps us hoping. As Christians, the Gospel Message that promises “happy is the man who does not lose faith in me,” keeps us hoping. Do it and you will experience at the deepest level of your being, the transforming power of God’s love — a love that truly defies description! ← Are We Listening ?